Heart valve surgery repairs or replaces a damaged heart valve. There are four valves in your heart. They are the mitral, aortic, tricuspid, and pulmonic valves. 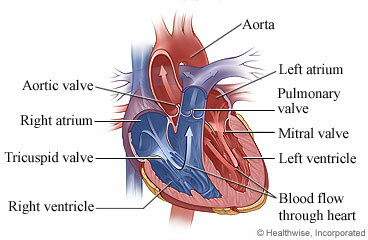 These valves open and close to keep blood flowing in the proper direction through your heart. When the heart valves do not close properly or are very tight and narrow, blood does not flow through the heart the right way. The doctor will make a cut (incision) in the skin over your breastbone (sternum). Then the doctor will cut through your sternum to reach your heart. The doctor will connect you to a heart-lung bypass machine, which is used to add oxygen to the blood and move the blood through the body. This machine will allow the doctor to stop your heartbeat while he or she works on your heart. While your heartbeat is stopped, the doctor will repair your heart valve. If the heart valve is badly damaged, it may be necessary to replace your heart valve with an artificial valve. The artificial valve may be made of plastic, metal, human, or animal tissue. Your doctor will talk with you before surgery about which type of valve is best for you. After the doctor has repaired or replaced your heart valve, he or she will restart your heartbeat. Then the doctor will use wire to put your sternum back together, and stitches or staples to close the incision. The wire will stay in your chest. The incision will leave a scar that may become less noticeable with time. You will stay in the hospital for 3 to 8 days after surgery. You will probably be able to do many of your usual activities after 4 to 6 weeks. But for 2 to 3 months you will not be able to lift heavy objects or do activities that strain your chest or upper arm muscles. You will probably feel better than you did before you had the surgery. For example, you may no longer have shortness of breath and fatigue. But you may continue to have heart problems. Before surgery you will be asked to repeat your full name, what surgery you are having, and what part of your body is being operated on. The area for surgery may be marked. The surgery will take about 3 to 5 hours. You will go to the intensive care unit (ICU) right after surgery. You will probably stay in the ICU for 1 or 2 days before you go to your regular hospital room. You will have a breathing tube down your throat. This is usually removed within 6 hours after surgery. You will not be able to talk or drink liquids while the tube is in your throat. After the tube is removed, your throat will feel dry and scratchy. Your nurse will tell you when it is safe to drink liquids again. As you wake up in the ICU, the nurse will check to be sure you are stable and comfortable. It is important for you to tell your doctor and nurse how you feel and ask questions about any concerns you may have. You will have a thin plastic tube, called a catheter, in a vein in your neck. It is used to keep track of how well your heart is working. This is usually removed in 1 to 3 days. You will have chest tubes to drain fluid and blood after surgery. The fluid and extra blood are normal and usually last for only a few days. The chest tubes are usually removed in 1 or 2 days. You will have several thin wires coming out of your chest near your incision. These wires can help keep your heartbeat steady after surgery. They will be removed before you go home. Enter A234 in the search box to learn more about "Heart Valve Surgery: Before Your Surgery".